From 2003 to 2011, Brooke Atkinson served as an Assistant Coach at New Mexico State University. Little did she know six years after leaving Las Cruces, she would return as Head Coach. Atkinson was named the program’s new Head Coach on May 3, 2017, taking over a program that previous Head Coach Mark Trakh led to three straight WAC Championships and NCAA Tournament berths. 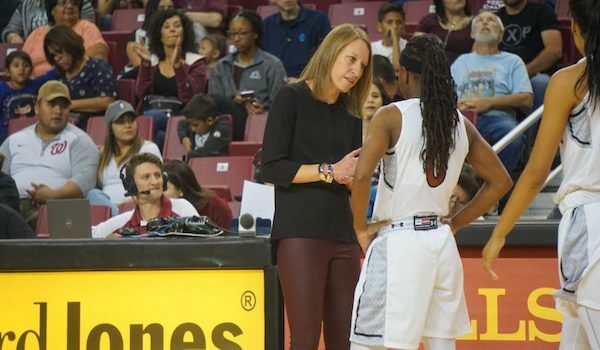 In her first season, Atkinson embraced the previous success and put her own stamp on the program, leading NMSU to the WAC Regular Season Championship and being named the conference’s Coach of the Year. Can you take us through the process up until and your emotion once you were officially named the new Head Coach at New Mexico State? Looking back at the process, it was such a whirlwind. In our business, things go from a standstill to a 100 mph. I love NMSU so to even be considered or a part of the process very humbling. I was excited, and if anything, it would be a great learning experience. When they narrowed down the candidates and it actually started to become a reality, all the excitement, nerves and fear started to come into the picture. Upon being hired, I was beyond excited and it was semi-unreal that I was just named the head coach at NMSU, where my coaching career began. Then it was time to get to work! Having spent eight years at New Mexico State as an Assistant Coach earlier in your career, how did that help ease the transition to taking over the program as Head Coach? It helped with the entire process. Already knowing NMSU, Las Cruces, the city and the amazing community, allowed me to focus solely on the coaching aspect. After taking over a program that had achieved a high level of success, what strategies did you implement to maintain that success while putting your own stamp on the program? During my six years away from NMSU, I always kept track of the program. Coach Trakh and his staff did an amazing job. I was fortunate coming in that I had friendships with two of his assistants, Tamara Inoue and Cecilia Russell-Nava so I had a lot of insight on what they had done and why they had done it. In my first year alone, Coach Trakh and I had numerous conversations as well. These are great people who wanted the program to succeed beyond their time here at NMSU. My motto was if it was not broken, why fix it. They had recruited a system and a type of kid here and it had worked. Fortunately, it was a system I was familiar and comfortable with. As time has gone on, the system is still very similar and I’ve added things to our system that I learned from the different programs I was apart of along the way, whether offensively, defensively, culturally, or academically. After your first few years as a first-time DI Head Coach, what advice do you have for other assistant coaches who desire to become a DI Head Coach? Your current job will pave the way to your next. Work hard. Always be ready and don’t get discouraged, you will get your opportunity when you least expect it.